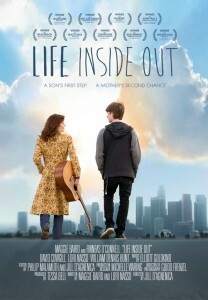 LIFE INSIDE OUT tells the story of Laura, the mother of three teenage boys, and her youngest son Shane, the family misfit and a disappointment to his father. When Laura stumbles upon her long forgotten guitar, she is taken under it’s spell and rediscovers her love for songwriting. When she impulsively flies off to her first open-mic night; she takes an unhappy Shane along for the ride. Despite a rocky entry into the late night mélange of musicians and unusual characters that populate the club, Laura starts to blossom and Shane seems oddly at home. Soon, following his mother’s lead and with a little help from Youtube, Shane begins to discover musical gifts of his own. Although the family struggles under financial pressure and the path to creative expression is bumpy, Together, through the power of music, they’re finally able to make sense of a world in which they’ve felt so lost. Writer / Actor Jill Baird and Director Jill D’Agnenica joins us for a lively conversation on their award winning film, running a successful Kickstarter campaign that and the resoundingly positive chord LIFE INSIDE OUT has struck with audiences across the country. This entry was posted in comedy, drama, dramedy, Film School interview, Indie by admin. Bookmark the permalink.